Tag line: "For every beginning there is an end"
I wasn’t all that impressed the first time I saw Final Destination 2. Not the second time, either. For some reason, the movie didn’t click with me like Final Destination did, and while it had its moments (i.e. the kill scenes), Final Destination 2 felt like an inferior follow-up to the entertaining original. Well, I guess it’s true what they say: “The third time’s the charm”. I had more fun watching Final Destination 2 tonight than I’d ever had before. It’s the one-year anniversary of the Flight 180 disaster, and Kimberly Corman (A.J. Cook) is driving to Daytona for Spring Break with a few of her closest friends. While waiting to get onto the expressway, she has a premonition that a terrible crash is about to occur, and blocks the on-ramp in an effort to save the lives of those lined up behind her. The accident does, indeed, happen, and many who were supposed to die are saved. But as the survivors of Flight 180 eventually learned, fate has a way of catching up with you. Before long, the people that Kimberly “rescued” start dying off. Hoping to make some sense of it all, she pays a visit to Clear Rivers (Ali Larter), the last remaining survivor of Flight 180, who agrees to help her and the others find a way to cheat death. But how long can they keep the Grim Reaper at bay? One of the main problems I had with Final Destination 2 prior to this most recent viewing was the way it tossed Clear Rivers back into the mix. In an effort to stay alive, Clear checked herself in to a mental institution, not because she thought she was crazy, but because it was the safest place to be (she was living in a padded room). Having taken every precaution, she decides, rather abruptly, to risk life and limb yet again in order to help a group of people she’d never met before! It didn’t make any sense to me. This, coupled with the fact that those who survived the highway pile-up, all of whom were strangers to one another, suddenly became inseparable throughout the remainder of the film, felt a little too forced for my tastes. This time around, though, I kinda liked the mix of characters, and Ali Larter’s Clear complimented them perfectly. One aspect of Final Destination 2 that I always enjoyed was its various kill scenes, some of which are truly horrific. Kimberly’s “vision” of the pile-up kicks the movie off in brutal fashion, and is followed by a handful of very memorable deaths (one of the most elaborate involves a magnet in the microwave and a plateful of discarded spaghetti). We even get a few “fake-outs” along the way, where fate seems to be setting up a character or two to take the fall, only to pull back at the last minute (at times, these “mock” deaths are just as exciting as the real thing). 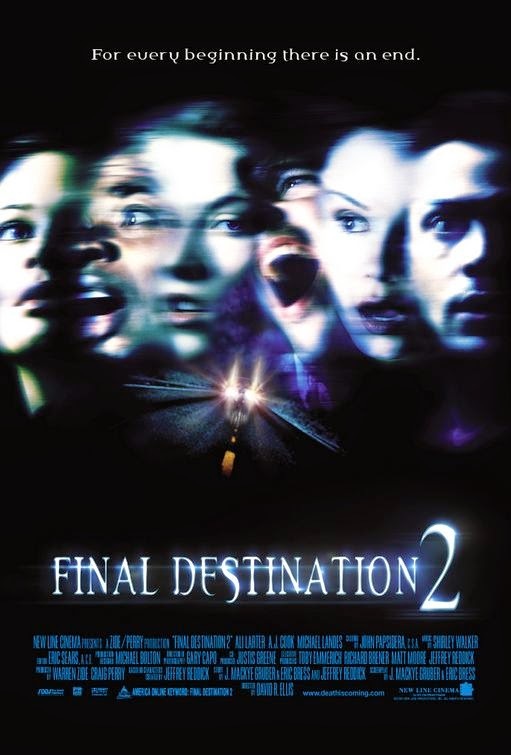 All in all, I’m happy to report that Final Destination 2 is a solid sequel to the original film, even if it did take me a while to figure that out!